We are just a couple of weeks away from the official unveiling of the Samsung Galaxy Note II and leaks have started to pop up all over the web. Today, what you see above is supposedly the front panel of the Galaxy Note II which seems to have appeared and has posed for the camera from the inside of one of Samsung’s factories. This can be guessed by the shoes that the photographer is wearing which are worn mostly in production lines. 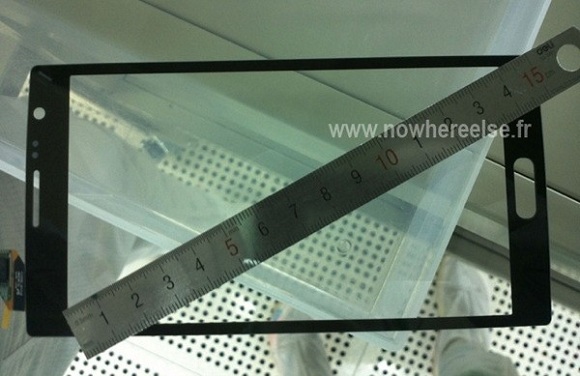 The screen interestingly measures exactly 5.5 inches diagonally which coincide with the previous rumours suggesting that the Galaxy Note II will arrive with a little bigger 5.5 inch screen instead of the original 5.3 inch. Also there will be the physical Home button on the Galaxy Note II and also the design of the Galaxy Note II doesn’t seem to be inspired by the Galaxy S III as the previous rumours suggested, if this picture is to be held true. The whole design is very squarish and is the display a little bent? We have heard that the new display could be flexible but we expect it to be more of a curved one and not flexible on the whole. But leaving all of it aside, mark August 29 on your calendars as it is when we will have a look at the Galaxy Note II officially.